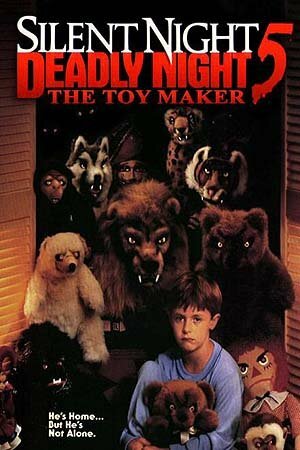 While many horror purists believe that the first one is the only “good” entry in the Silent Night Deadly Night series, I have always had a bit of a fondness for the joys and the awfulness of the fifth installment: Silent Night Deadly Night 5: The Toymaker. A sequel by name only, The Toymaker is one of the strangest sequels I’ve ever seen. A young boy sees his father killed by a toy that was anonymously delivered to his house. After that, he is too traumatized to speak, and his mother must deal with both him and the loss of her husband. Meanwhile, a toy maker named Joe Peto builds some suspicious-looking toys, and a mysterious man creeps around both the toy store and the boy’s house…but who is responsible for the killer toys? The twist at the end needs to be seen to be believed (shades of Sleepaway Camp). I can’t in all honesty say this is a “good” film but I can say that you’ve never seen anything like it. Besides who DOESN’T want to see a horror movie version of Pinocchio?